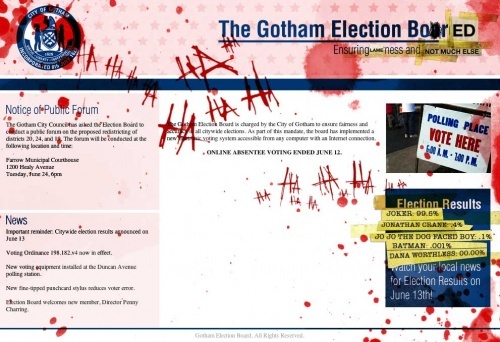 Gothamelectionboard.com is an online voting site for the city of Gotham. 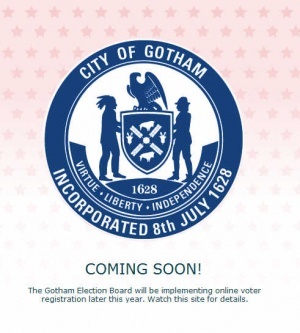 The Gotham Election Board will be implementing online voter registration later this year. Watch this site for details. The site is updated with a voting system. 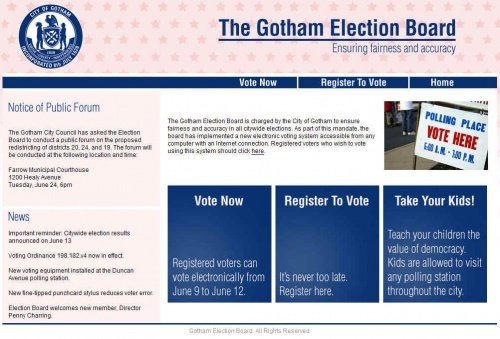 The Gotham Election Board is charged by the City of Gotham to ensure fairness and accuracy in all citywide elections. As part of this mandate, the board has implemented a new electronic voting system accessible from any computer with an Internet connection. Registered voters who wish to vote using this system should click here. Voting Ordinance 198.182.v4 now in effect. New voting equipment installed at the Duncan Avenue polling station. New fine-tipped punchcard stylus reduces voter error. Election Board welcomes new member, Director Penny Charring. Teach your children the value of democracy. Kids are allowed to visit any polling station throughout the city. There is a field where the participant can enter in their voter ID and email address, from the voting card they received in March. Once the participant is logged in, they can vote for all of the propositions described on their voting card, as well as for their candidate for Gotham City District Attorney, Municipal Judge, and Mayor. Residents who will be in Gotham City on Election Day should register in person at the Gotham Election Board Offices at City Hall. Office Hours are M-F from 8:00 am to 5:30 pm. If you are a Gotham City resident who will be outside of Gotham City on Election Day, you can use the form below to register to vote. This is now an all-electronic registration, so you will receive no paper confirmation or voter card. You will receive a verification email, and once you reply to it, you will be sent your unique registration number. This registration number will be used when voting via our new online absentee voting system. 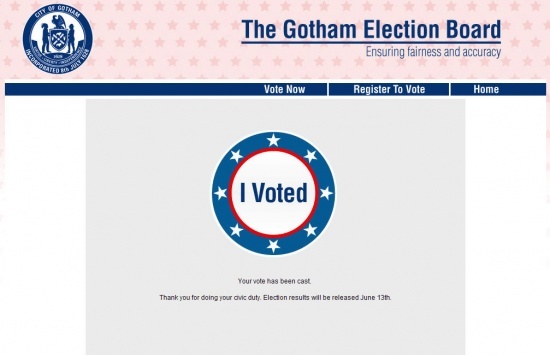 There are fields where the participant can enter their residential information and email address, to possibly receive another copy of The Gotham Times and a voter ID code. ONLINE ABSENTEE VOTING ENDED JUNE 12. After the end of the countdown on Whysoserious.com/Overture, Gothamelectionboard.com was "Jokerized." This page was last modified 18:04, 11 July 2008. This page has been accessed 36,315 times.